2010 is the year of 3D viewing and Panasonic have the ideal home theatre system if you’re looking to get on the bandwagon. 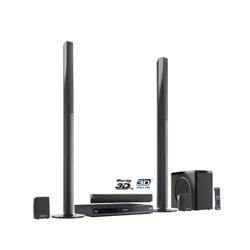 The Panasonic SC-BTT750 system sports full HD 3D Blu-ray Disc playback, along with PHL Reference Chroma Processor Plus and Pure Direct Sound Speaker technologies. Wi-Fi connectivity allows you to sample VIERA Cast’s assorted online content and just for all you Apple fans the SC-BTT750 can access your iPod or iPhone data. We couldn’t find any reviews yet as the SC-BTT750 is pretty fresh, but we’ll try and add some as and when we come across them. The system will go on sale for around $750, so if you’re after a full HD 3D surround sound experience the Panasonic SC-BTT-750 may just be the start for your new home theatre system.